I recently started a litter series here at Blissful Roots called 'My Favorite Blogs Series'. Last week was Diana @ Our Vintage Home Love. 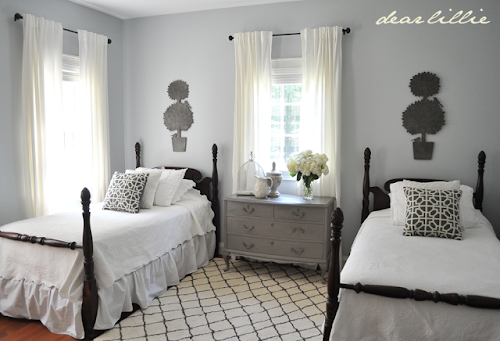 Today, I'm featuring Jennifer from Dear Lillie. I can't quite remember how I happened upon Dear Lillie, but I'm sure glad I did! Her home is so inviting! She knows just how to add that little touch of something to make a space extra special, and her style is spot on for me. Here are a few photos of her old home. She and her husband recently bought a new home and are in the process of fixing it up. Her fridge is stainless steel, but it looks a bit blue in this photo, doesn't it? I never thought I'd say this, but I would totally go for a blue fridge if it looked just like this one- with the kitchen to go along with it of course! This was one of my first kitchen pins on Pinterest. I fell in love with her IKEA plant and fruit holder hanging on her island. I also love her photo garland in the window. You can see where Jennifer gets her amazing sense of style. This is her parent's guest bedroom. Her mom did most of the decorating, but Jennifer did find the rug and pillows to finish the room off. 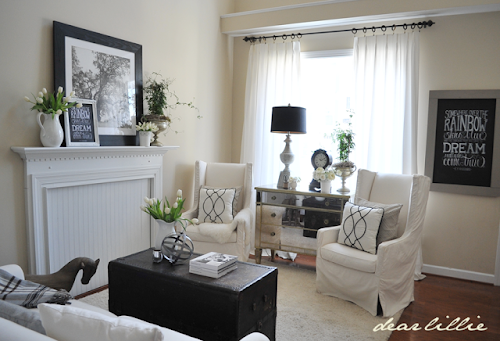 She has a post with her living room decorated three ways. This photo is one of them. 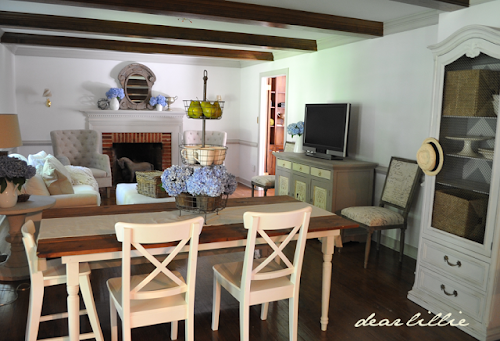 Like Diana's home, I love how Jennifer uses whites and creams with wood. I also really like the use of black in this room. Her chalkboard art is amazing! She does it all by hand! Look at this dinning room! Just like I said, so many little touches that make this room extra special. Jennifer has two daughters (she's an amazing photographer, and has some priceless shots of her girls). 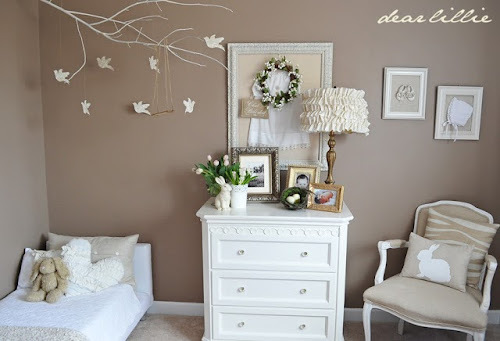 This is her youngest daughter's room. Isn't it absolutely sweet? 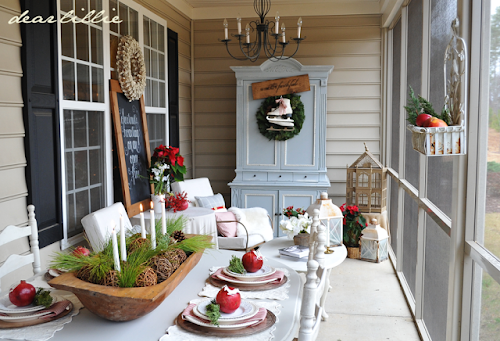 Even her back porch is dressed to the nines. Another reason I love Jennifer's home so much is because she likes to add bits of holiday decor here and there. She even adds little bits to her girls' bedrooms during the holidays. I mentioned Jennifer's amazing talent for chalkboard art. This is her latest. Beautiful, isn't it? Dear Lillie also has its own shop. 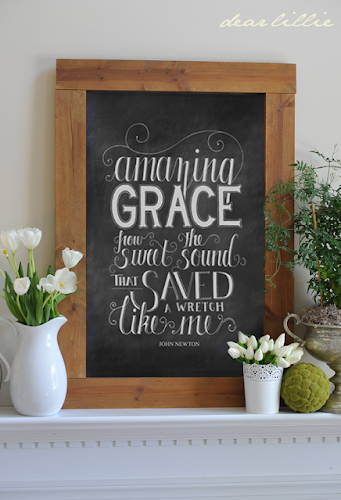 You can buy this Amazing Grace print and many others here. 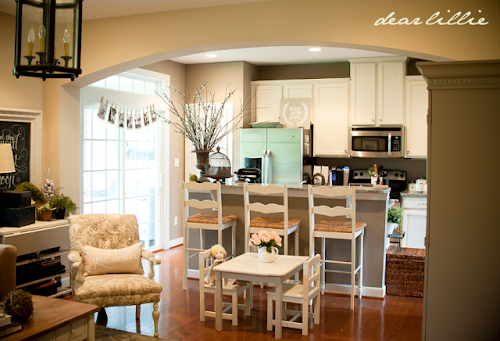 And here's the first peek into Jennifer's new home. They've been hard at work painting and remodeling a few things. I can't wait to see what else she has in store with her new home. Thank you so much, Jennifer for opening your home to us! And thank you for letting me feature it here at Blissful Roots. 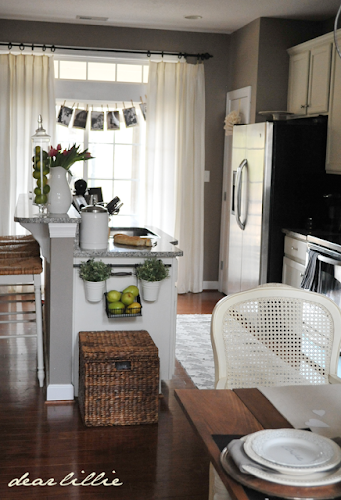 I've decided I need to put Jennifer's home photos on my blog every day. They sure make me look good! But I can't take credit for any of them. So glad she's willing to share! Go visit Dear Lillie today! Oh, and if you missed last week's favorite blog feature (Diana @ Our Vintage Home Love), then click here to see her beautiful home. Oh my goodness, her house is gorgeous! Totally going to have to check out her blog. Thanks for sharing Brooke! You really need to go check her out. I wish I had more time to put on more pictures. 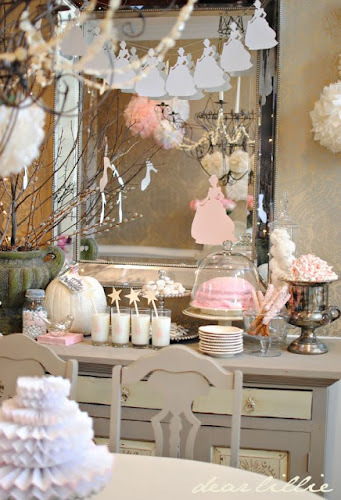 She has so many more at Dear Lillie! Thanks so much for visiting, Julie! Enjoy your weekend. Thanks so much for sharing, Brooke! You are so sweet! Thank you, Jennifer for allowing me to share. Your home is beautiful, and you're incredibly talented! Thanks for all the inspiration! Enjoy your weekend! Hey, Chris! I just popped over and I'm now YOUR newest follower. I got looking at your My Style Pinterest board, and just kept repinning just about everything you have. Amazing taste! Thanks so much for visiting and following. Come back anytime! 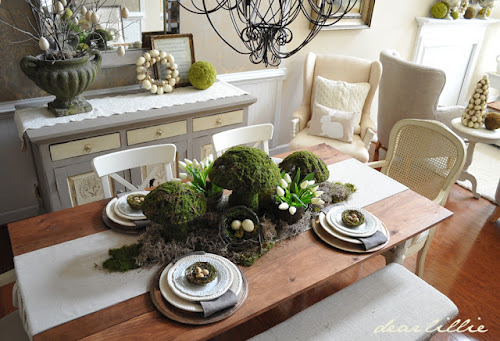 I, too, just adore Jennifer's blog and the way she decorates her home(s). I think I discovered her through her amazing photography and have never looked back. Thanks for sharing. I love her blog too! Thank you for sharing at Give Me The Goods!